The most affordable resorts on Redang are the budget resorts while Taaras (Berjaya), Sari Pacifica and Laguna round off the highest end of the budget scale. Prices among the budget resorts are competitive, mostly below MYR450 per person for a 3D/2N full-board snorkelling package which include accommodation, food, boat snorkelling trips and ferry transfers between Redang and the mainland. Children below 12 are usually given a discount paying between 50-60% of adult fare. Additional nights may also be purchased to extend one's stay and resorts usually publish both 3D/2N rates as well as additional night's rates. An additional night purchased for a full-board package includes all meals and 1 or 2 boat snorkelling trips. Most resorts have different prices for off-peak and peak periods. The lowest prices are usually for March and October during beginning and end of visiting season. At other times, lowest prices are found weekdays from Sundays through Thursdays. Many resorts levy surcharges for Fridays, Saturdays and eve of public holidays, as well as for major school holidays. Typical 2013 non-promotional weekday rates for 3D/2N twin-sharing full-board per person inclusive ferry transfers to/from mainland. (*lunch not provided / **2012 pricing). Some resorts also offer room-only rates, or free and easy rates with only room and breakfast. While these may appear more affordable, these rates usually do not include ferry transfers which are charged extra. Whichever you go for, full-board or free and easy, read the fine print carefully to understand what's included in the price and what's not. For divers, many resorts offer full-board dive packages which are similar to the standard snorkelling packages except the snorkelling sessions are replaced by 2-3 boat dives a day. Prices of dive packages are higher and often do not include rental of dive gear like BC, regulator, mask, fins and weight belt. Some resorts like Taaras, Laguna and Sari may also offer fly-stay packages which include return air travel on Berjaya Air from Kuala Lumpur or Singapore together with a full-board or free and easy stay. 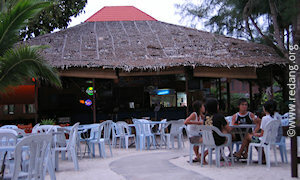 Taaras (Berjaya) is the only resort at Teluk Dalam beach. Mutiara is the only resort on its beach at south Kalong. So you came here to ponder about life, sunbathe, write a book, compose a song, spend quality	time with your partner, and you really need some privacy and quiet. Best thing to do is go off-peak	season when it's not school holidays, public holidays or long weekends. In March or October the beaches can be pretty empty. 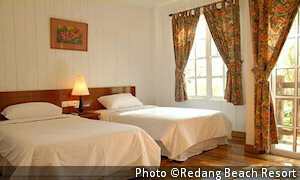 Resorts located at Teluk Kalong offer good privacy, peace and quiet with no noisy beach discos or karaokes. There are 3 beaches here separated by rocky outcrops. The northernmost beach is occupied by Redang Kalong. Wisana (formerly known as Amannaggapa) is the only resort on the middle beach and on the southernmost beach sits Redang Mutiara which is now the lone resort there since the campsites closed down in April 2006. Taaras offers both privacy and creature comforts as it is the only resort on its beach. Although the resort is big and may have many guests during peak season, guests have access to two long	stretches of beach at Teluk Dalam Kecil and Teluk Dalam Besar, so they should be able to find their own private, quiet space on the beach. If beaches aren't your cup of tea, and you prefer some solitude on a hillside instead, try Redang Island Resort located at Teluk Siang near the airstrip. Pasir Panjang is the most active beach on Redang, shared by many resorts. Beach discos, karaokes and open air food stalls attract many visitors who may traverse up and down the entire stretch of beach. Resorts offering the best privacy and quiet are at the ends of the beach such as Redang Reef, Redang Holiday and Laguna's standard rooms near their dive centre at Teluk Bakau. If you're looking for good beaches, you've come to the right place. There are no bad beaches in Redang. 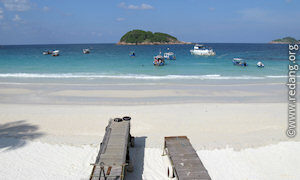 At all resorts (except Redang Island Resort), you'll find soft, fine white sand beneath your feet. Stormy weather and strong waves can deposit debris and broken coral on the beach but over time, the sandy beach is restored when new sand is deposited. Most visitors would agree that the nicest beaches are in Teluk Dalam, followed by Pasir Panjang and Kalong. Teluk Dalam Besar beach next to Taaras resort. 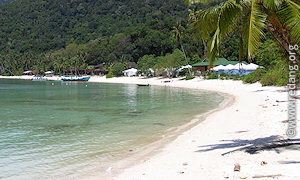 Teluk Dalam ('Deep Water Bay') has 2 distinct stretches of beach, one at Teluk Dalam Kecil where Taaras is located and the other at Teluk Dalam Besar where there are currently no resorts. Waters are clear and calm with sandy bottom	which is excellent for swimming. The two beaches are separated by a hilly outcrop. A road built on top of the hill provides easy access between the two beaches. A jungle path also connects the beach at Teluk Dalam Besar to Pasir Panjang, a trek that can be covered in about an hour. Teluk Kalong beach near Redang Kalong resort. North Pasir Panjang beach in front of Redang Bay resort. Pasir Panjang ('Long Beach') is a long and wide beach shaped like a birdwing or 'V' where one wing forms the northern stretch while the other the southern stretch, both wings meeting at Tanjung Tengah in the centre. The north beach is longer than the south beach. Visitors can walk from Redang Reef at the southern tip all the way to Redang Holiday at the northern tip in about 15-20 minutes. Teluk Kalong's 3 beaches are each much smaller than those at Teluk Dalam and Pasir Panjang but with so few resorts and guests at each beach, at times you can have the entire beach to yourself. The northernmost beach is the only one accessible from Pasir Panjang. If you want to be able to just walk off the beach and go snorkelling anytime, your best choice is to stay at Pasir Panjang which offers the most easily accessible house reefs. The resorts located here have easy access to the reefs which are located in the centre around Tanjung Tengah and at both ends of the beach at Tanjung Mak Cantik (where Redang Reef is located) and the other end where Redang Holiday is located. Teluk Dalam Kecil also has coral reefs on both sides of the bay but these are further out and not as easily accessible compared to those in Pasir Panjang. Over at Teluk Kalong, there is a house reef south of Redang Kalong resort which offers opportunities to spot adult black-tip sharks but it's quite a distance from the shore. Most resorts offer acceptable standards of accommodation. 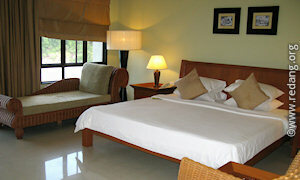 For example, all resorts offer air-con rooms with attached bathrooms while many are also equipped with hot showers. Every year, standards are improving across the board as resorts continue to renovate and upgrade to compete with one another. Taaras, Sari Pacifica and Laguna resorts set the standard at the high end of the comfort scale as they pamper guests with quality furnishings, in-room TVs and phones, electric jugs, hair-dryers, mini-bars and safe deposit boxes. For those looking for the best accommodation in Redang, look no further than Taaras's premier suites on the hilltop with spectacular seaviews and in-room jacuzzis. Sari Pacifica's villas are also luxuriously appointed with in-room jacuzzis. In terms of resort facilities, Taaras and Sari Pacifica offer full spa facilities and complimentary wi-fi access in all rooms. Taaras and Laguna also have gyms as well as a clinic with a full-time doctor. Doctors will treat guests from any resort but medical emergencies will be sent back to the mainland for treatment. The smaller resorts may not offer guests as many facilities and services but usually provide a cozier experience and a more personal touch. In this group, Coral Redang's chalets and Redang Holiday's villas are among the most comfortable, the latter's hillside seaview villas offer guests spectacular views of the sea and south Pasir Panjang. The chalets at Redang Beach and Redang Pelangi are probably next on the comfort scale, followed by the other resorts which offer basic accommodation in rooms that are furnished with beds and little else - not a problem if one is out at the beach or sea the whole day and just a needs a place to rest at night. 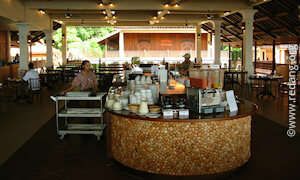 Food outlets at Redang Bay resort. Hazeme restaurant at village near Taaras. Food is usually home-cooked local Chinese or Malay style and served buffet or pre-apportioned. At the budget resorts, lunch and dinner are balanced affairs with a seafood dish (usually fish or squid), meat dish (usually chicken), vegetables, soup and fruit. 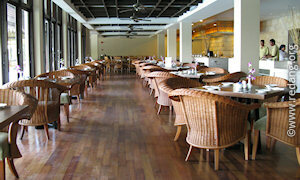 At the higher-end resorts, the buffet spread has a lot more variety with a mix of local and Western fare. Pork is not on the menu for packaged meals as resorts have to cater to Muslim guests. So any bacon served is likely to be beef or turkey bacon while 'char siew' (Chinese roast pork) is made from chicken meat. Most resorts should be able to accommodate the dietary needs of vegetarians	as long as they have advance notice. For other special dietary requirements, check with the resort first. There's enough to eat though when there are a lot of guests, the best stuff disappears quickly which means it's better to be among the early birds at mealtimes. Usually a BBQ dinner is served every other evening. Some budget resorts offer 24-hour self-serve refreshments (water, tea, coffee, Milo), cookies, crackers, bread and spreads if you want to snack outside meal times. 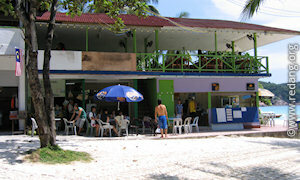 You can also buy snacks and drinks from the little sundry shops available at most resorts. If you are not on a full-board package, or you prefer to avoid battling the hungry hordes at the buffet table, there are ala-carte restaurants and food courts at resorts in Pasir Panjang and Taaras but not at Kalong beach. These eating places are open to everyone, not just guests. There are upmarket ala-carte restaurants in Taaras, Coral, Laguna (Sang Suria) and Beach (Summer Palace) serving both local and western fare, including steamboat. Visitors staying at Pasir Panjang have easy access to food courts or local-style cooked food shops such as Laguna's Food Court, Redang Beach's Summerpoint and Kopitiam and the eateries at Redang Bay. 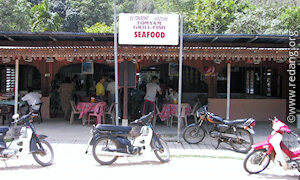 The Redang Bay eateries are available most part of the day, while the rest open from evening till late at night. Between them, one can find delicious local fare like Ramly burgers (Kopitiam), roti canai (Laguna food court),	seafood, rice and noodles (almost everywhere), fried cempedak, keropok lekor, teh-tarik and ice-kachang - great for those used to eating late-night suppers. Prices are reasonable too. At Bay, fish and chips, lamb chops and steaks go for RM10-18 while fried rice and noodles are around RM5-6. Over at Summerpoint, fried rice and noodles go for RM7-8 while fish-head curry can be had for RM25. For dessert lovers, there's ice-kachang and ice-cream available from Laguna's poolside cafe and Redang Beach's La Patissiera bakery/desert shop. Guests at Taaras in Teluk Dalam do not have easy access to the eateries at Pasir Panjang but they can visit the nearby kampung (village) restaurants such as Aima Grill and Restoran Hazeme about 5-10 minutes walk along the village	road outside the resort entrance. These offer a range of local Malay or Thai style cuisine at affordable prices. Some village boat operators are listed below. I have not personally used their services. Use at your own risk and be prepared to bargain. All resorts have snorkelling equipment (mask, snorkel, life-jackets) for rental on a per-stay basis. Underwater cameras for use during snorkelling or diving are available for rental at Pelangi - cost is RM30 per day from 9am to 5pm. In order to protect the corals, fins are no longer available for rental to snorkellers in Redang from April 2006 (only divers can rent fins). 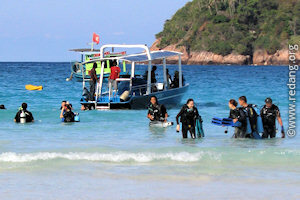 Guests on snorkelling packages are usually brought to the Marine Park Centre or one of the other snorkelling sites around Redang. If you are not on such a package, you can still join the snorkelling trips but you will have to pay for each trip. Some villagers also offer snorkelling packages which bring you to 3 or more places and lasts half a day - prices are negotiable and also depend on the number of people in your group. Those staying at Taaras can easily walk to the village and enquire. Otherwise ask your resort staff or boatman for contacts. 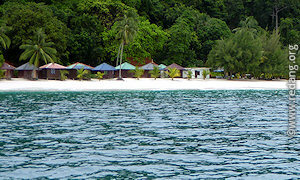 Many resorts and village boat services also have boats for charter (useful if you are planning trips to nearby islands like Bidong, Lang Tengah, Yu or Perhentian) though their availability may be limited during peak season as resorts may use additional village boats to meet guest demand. There are also sunset cruises offered by some resorts like Laguna but require a minimum number of passengers before they set off. Check with resort staff. One thing to note is that if you charter boats from the village, you may not be covered by insurance should anything happen, so it's a risk to bear in exchange for more attractive rental rates. Dive centres are found at almost every resort. You are free to dive with any operator. If you are an avid diver, enquire about dive package holidays which are similar to the normal package except you go diving instead of snorkelling. You can also just sign up on the spot whenever you feel like diving - costs around RM90 for a single boat dive a day with equipment and about RM150 for 2 dives a day with equipment. If you are not a qualified diver, you can experience scuba diving by signing up for 'discovery dives' where qualified instructors will give you a crash course and personally bring you on a shallow 1-hour dive for about RM160. If you decide to get certified, you can join a 4- or 5-day basic open water program under qualified PADI or NAUI instructors at any of these dive centres - prices start at around RM850 for the course alone excluding	board & lodging. Beach volleyball at Pasir Panjang. Other than snorkelling and diving, most resorts offer basic recreational activities like beach volleyball/soccer, table/board games and cards. Guided treks are also available. The bigger resorts offer more recreational facilities like pool tables, darts,	table football and TV/video entertainment. Kayaks are available for rental at a few resorts along Pasir Panjang and Taaras while freshwater swimming pools are available at Taaras, Laguna, Coral and Redang Bay resorts. Massage and reflexology are available at Laguna's recreation centre and Beach's Bamboo Inn, while professional spa services are available at Taaras. 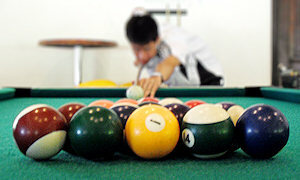 Pool table at Laguna's recreation centre. Both Laguna and Taaras have a gym and water rides like banana boat or tubes. More uniquely, Laguna offers archery while Taaras offers windsurfing and paragliding. Bicycles are available for rent at the village outside Taaras. The only road on Redang leads from Taaras at Teluk Dalam through the village to the Kampung jetty. There are no roads in Pasir Panjang or Kalong	although the movie 'Summer Holiday' gives that impression - actually, the actors ride a motorbike from Mo Mo Cha in Pasir Panjang and magically appear in Malacca town thanks to film editing! If you're still full of energy after a whole day of diving, swimming and snorkelling, Pasir Panjang is the right place to be for a more exciting nightlife. 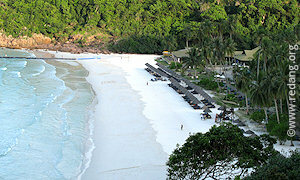 Visit the beach discos at Redang Beach and Pelangi or the indoor air-con disco at Laguna. Many resorts offer outdoor karaoke so you can frighten sleeping fishes or if you're shy, try the indoor karaoke rooms at Laguna's disco. You can also chillax at bars and cafes found at various resorts where beer, wine and alcoholic beverages are available for non-Muslims only. If you're tired of listening to the aspiring William Hungs on karaoke, head for more pleasant sounds of live bands at Taaras and Laguna. For those of you who must update your Facebook page with your latest beach photos or stalk your friends or tweet about your lovely tan to the whole wide world, many resorts now have internet access either through wifi or internet cafes. In-room wifi is available in the higher-end resorts like Taaras and Sari Pacifica. At other resorts, you can usually get wifi in the reception or lobby area. Some are complimentary while others may charge a small fee. If you need to do this while bumming on the beach or on the snorkelling boats, your best option is through mobile 3G data services.